Horror doesn’t always need to mean making an audience jump, nor does it need to involve things that go bump in the night. This Halloween weekend I shunned the usual serial killers and vampires and sat down to watch John Hillcoat’s adaptation of Cormac McCarthy’s novel, The Road (2009). The film is no less appropriate viewing, as it focuses on the horror of existence in defiance of all odds. That old feeling of horror is here mixed equally with despair, ultimately raising the question of hope or hopelessness. As an admirer of McCarthy’s 2006 novel, I was unsure of how it would manage the translation to the screen. So much of the effect of The Road is in its sparse prose and poetic dialogue. The pitfall, as is often the case in negotiating the tricky work of film adaptation, is that when reduced to its bare elements will the plot add up to more than the sum of its parts? How does a filmmaker inject a tale with cinematic verve? While the film is appropriately bleak, I can’t help but feel that it falls slightly short of the greatness of McCarthy’s novel. Perhaps no film could have satisfied what I wanted out of it. It could be my own expectations. Hillcoat’s film translates many of the novel’s key sequences to the screen with a minimum of fuss and manages to capture its unsettling imagery, but in the effort to pack it all in it drives narrative momentum forward rather than lingering on some of the small moments. It captures a vision of a dying world, complete with treeless horizons and constantly overcast skies, but at times feels strangely constricted. The reality is that not much happens in the story. The human characters (the only characters in a world where nearly all animal and plant life is gone) are grimy and grim faced. There’s a strange awe at the sight of the Father and Boy sleeping in an abandoned big rig on a deserted overpass. At other times the bleakness of the world, and particularly its inhabitants, becomes overwhelming, as it should. And this is where the film works best. The world of the film is one of survival of the fittest; there is no room for miscalculations or unearned sympathies. Hillcoat and screenwriter Joe Penhall also resist attributing cause to calamity that befalls the earth, no small feat when creating cinema for a vulgarizing Hollywood system that encourages artists to aim for minimum ambiguity. It is that ambiguity that keeps the film from becoming merely an exercise in visualizing the novel. The dynamic between the nameless Father (played by the always excellent Viggo Mortensen) and the Boy (Kodi Smit-McPhee) is preserved and translates cinematically. How is the Father to keep going, to preserve hope in his son’s life, to “carry the fire”? The interactions between father and son become a microcosm of the greater question of how we interact with a world filled with horror. While not facing starvation, freezing, and cannibals at every turn, our reality is no less fraught with danger and the fragility of human life. How do we instill hope in the next generation when we ourselves have lost it? That question becomes a litmus test for our willingness to believe in the survival of human goodness, even if it is a bit of a narrative cheat (nothing in the story leads us to think that such an ending is possible). McCarthy (who elsewhere has been accused of nihilism) basically reverses the Hobbesean proposition that in the absence of civilization the natural condition of humanity is one of “war of everyone against everyone.” It is the Father who remembers the previous world who distrusts everyone and neglects simply human decency in the desperate scramble for survival. There is no reason to expect the Boy to behave the way he does unless you believe that people have an inherent moral compass. The Road can be viewed as a kind of manifesto of the indefatigable spirit of humanity in the face of all odds. It is the relationship between the Father and Boy at the heart of the story that gives it its power, and the film preserves that. It’s hard to be particularly disappointed with a film as good as this one is. The film captures the horror and hope at the heart of McCarthy’s tale, even if it doesn't quite have the same resonance. 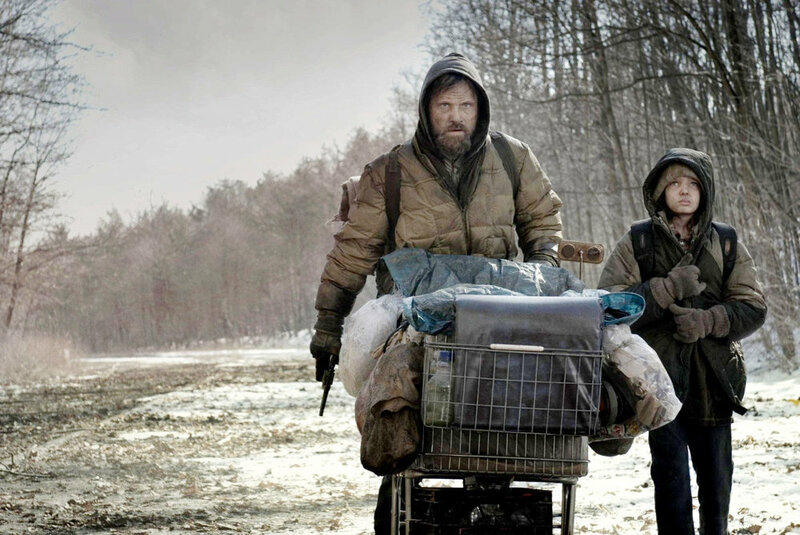 Directed by John Hillcoat; screenplay by Joe Penhall based on the novel by Cormac McCarthy; starring Viggo Mortensen, Kodi Smit-McPhee, Charlize Theron, Robert Duvall, Michael Kenneth Williams, and Guy Pearce.